This memory is only a snapshot, a minute of film with the details gone fuzzy but the composition and the action intact. I’m struggling to figure out what it means, why it seems important to write it down. Inner city Indianapolis, midafternoon, on a Saturday in summer. My mother is at the wheel of a car, me beside her. A man stands outside my window. We are in the white man’s no-go zone between 10th and 38th streets. It is 1968, and I am 13. 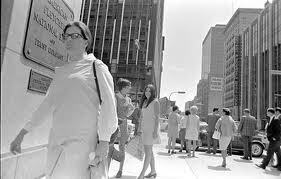 I’m guessing we are returning from the Lane Bryant store in the inner city that was the only place to buy fat-girl clothes, because that’s about the only thing that would have me at that place, in the car with my mother, at that age. The trip from our home in white and prosperous Carmel into the heart of Indianapolis, also still white and prosperous, would take most of an hour. Shopping would take another hour, and then begins the trip home—an afternoon carved out of my working mother’s all-too-brief weekends. I understand there was concern for me in that, although my mother never showed an emotion I knew how to read. We are in the car, headed north. Because it is a hot summer day our windows are rolled down. We come to a stop at a red light somewhere in the no-go zone. A black man walks up to the passenger’s side of the car and stops. Does he have time to cross the street in front of us before the light changes? He hesitates. My mother leans over me to press down the little silver pillar, locking my door. “Lady, I’m not going to hurt you,” the black man says. My mother makes noises that are not words. She cannot find any words to say. Still leaning across me, she pulls the little pillar up again. “Too late for that,” the black man says. My mother makes more noises that are not words. The light changes. We pull away. The memory ends there, leaving me wondering to this day what exactly happened, and why, and who was changed by it.